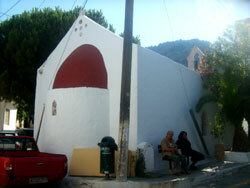 • A small church, widely regarded to be one of the most important church in Crete by experts. • Woven and crocheted blankets and cloths. 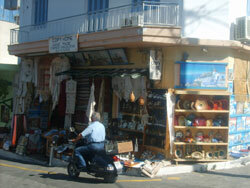 Kritsa is probably the only village that has kept this traditional handicraft so prominently in its economy. 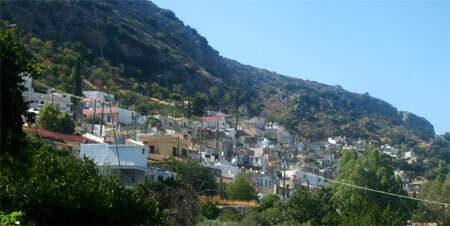 Most visitors to Kritsa start investigating the village by looking at the church (called Panagia). From the outside, the church does not look as if it should deserve its reputation, but once inside you’ll see a series of beautiful frescos, believed to be some of the most important in Europe. The church closes at 3pm. It’s a 15 minute walk to Kritsa from the church. 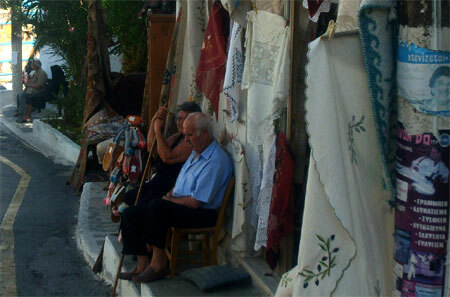 Along the way you’ll pass dozens of shops selling the town’s woven blankets – some of the shop keepers are a bit pushy. Whether they are indeed made in Crete – or China – is hard to say, but most the shops here are selling plenty of typical tourist souvenir trinkets to take home. I don’t think the blankets are a bargain, and it’s a shame to see how tourism can ruin a nice village. In the centre of Kritsa, there’s a pleasant plateia (town square) surrounded by some coffee ships, restaurants (not cheap), and a few kafenions. These traditional bars are a dying breed in Crete, but seem to thrive in Kritsa thanks to tourism. Kritsa is easy to get to by bus. From Agios Nikolaos in summer, there’s an hourly bus (20 mins, ticket-price about 2 € in 2019). In spring and autumn there are less buses (about 6 a day). The nuses stop near the famous church and in the center of the village. Some buses go on to Kroustas.